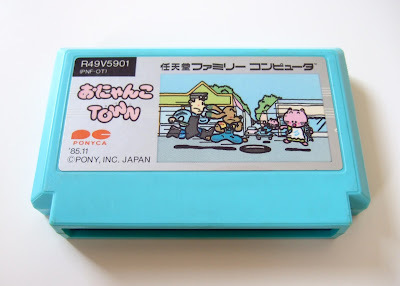 I've written about this Japan-only Famicom game a few times before. 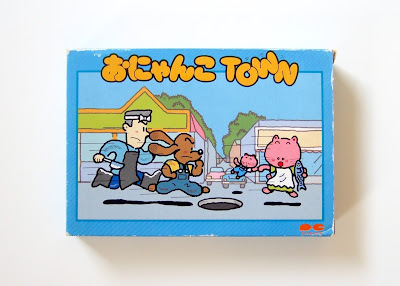 I first mentioned Onyanko Town last fall in this "Shall We Do It?" write-up after my maiden experience with it. Early this year, I brought it up again in a post about my five favorite Pac-Man clones. So, why am I covering it once more? 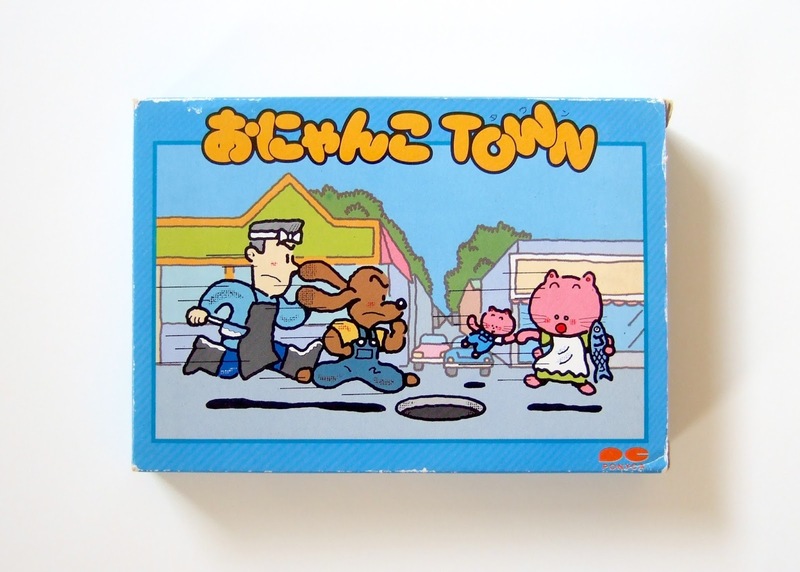 Because neither of the aforementioned posts included photos of Onyanko Town's adorable packaging. 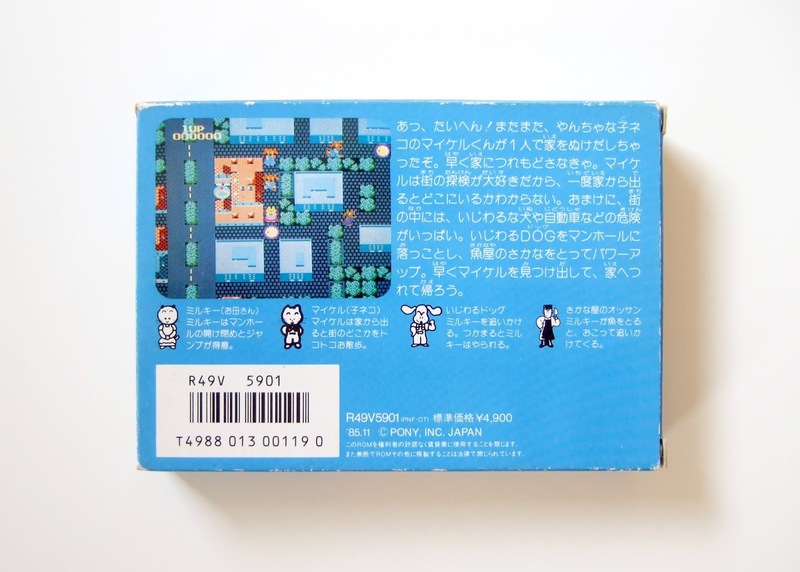 By far the most appealing component of this game's packaging is its outer box--or at least that's my opinion on the subject. I mean, you'd need a heart of stone to dislike the Onyanko Town logo, which is lovingly crafted out of yellow-orange bubble letters. The same is true of the so-cute-it-could-make-you-barf cover illustration that sits beneath that logo. The characters showcased on the front and back sides of this Famicom game's box are the only ones you encounter while playing it, by the way. 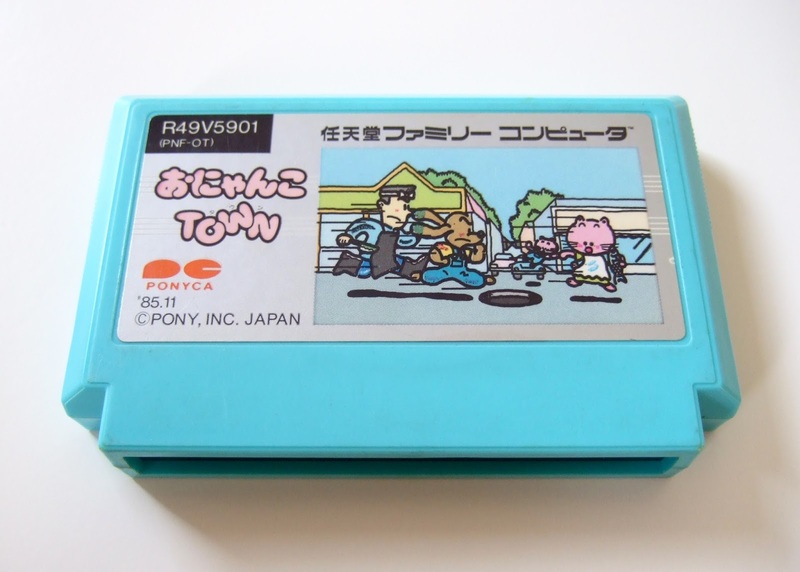 The larger cat on the far right of its cover art, the one grasping a fish, is who you control once the game begins. As for the kitten she's holding with her other paw, that's her baby, Michael. He runs away (or something of the sort) at the start of every level, and then you, as Mirukii, chase after him and drag him back home. 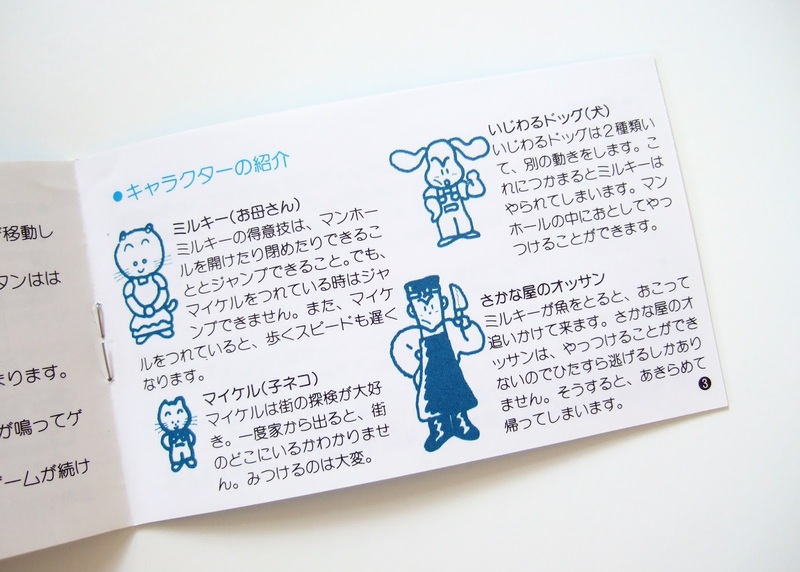 The "nasty dog" depicted in the upper-right corner of the manual page below (see the whole Onyanko Town instruction booklet here) basically serves as this title's version of the ghosts that populate Pac-Man's pellet-riddled screens. A number of them stalk this copycat's levels. Should they catch you or your son, it's game over. 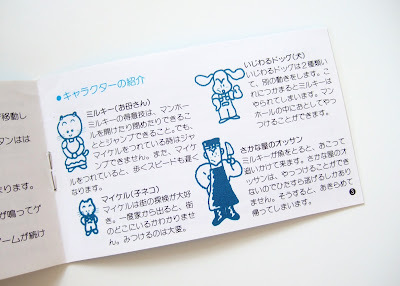 The fishmonger seen in the lower-right corner of the sample manual page above, as well as on the far left of the cart label below, also gives chase if you dare to steal one of his future fillets. Thankfully, you can get these brutes off your tail by flipping the lids of the manholes that cover Onyanko Town's busy streets and sending them tumbling into their putrid depths. This evasive action only offers a temporary reprieve, however, so keep that in mind if you ever decide to play Onyanko Town yourself. With all that out of the way, this 1985 release's packaging is surprisingly nice, wouldn't you agree? Its key art is recycled a bit more than I'd like, I've got to admit, but other than that I personally think it's pretty sweet.